I'm starting to believe that my babies are put on this earth with a secret side-mission to teach me a lesson in control. More specifically that, despite my best efforts, I cannot control everything that happens to me. Once again, I find myself struggling to accept certain things about this pregnancy that are completely beyond my control (I'll explain in a second). And if my first experience with motherhood has taught me anything, I know very well that this is likely to continue after this baby is born. This second pregnancy has really just flown by, at times completely unnoticed and almost forgotten about. Working 5 days a week, and caring for an all-consuming and deeply-satisfying two-year-old leaves very little room for quiet reflections about this growing life inside me. 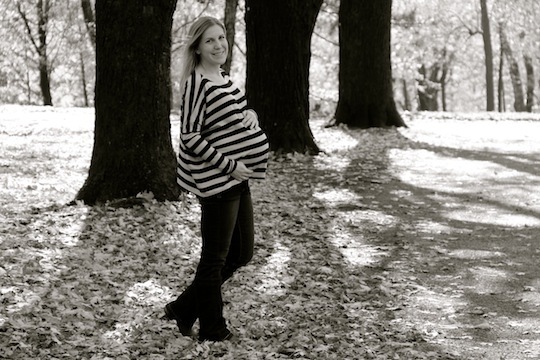 There have been almost no baby bump photos along the way this time around, no prenatal yoga classes or massages, no luxurious afternoon catnaps on the couch just because. But now that I've officially entered my final month of pregnancy #2, things are starting to feel more real. Physically, I can't ignore it anymore. I'm starting to feel really tired again. By the time I get Zac into bed by 8pm, I find myself ready for sleep myself, and usually hit the sac at around 8:30pm! I officially started my maternity leave today. Though I could certainly continue to work at this point, it's a little too risky to be working and living in the remote regions of northern Canada... far, far, far away from proper obstetric care. So yesterday, Zac and I boarded the plane to Montreal and said goodbye to the north for the next 3 months. I'm not going to lie, I'm not at all sad about missing the next 3 months of bitter cold up there (not that Montreal is "warm" by anyone's standards, but it's a lot warmer than up there!). My husband will join us in one week from now. Pray for me that the baby stays put until then! It honestly never occurred to me that this might be an issue for me (Zac was vertex my entire first pregnancy), but alas it is... And it's a big issue for me. Ever since my first birth experience, I have been pretty excited and motivated to try it again. I feel like I know what to expect now, I have the confidence, I'm not afraid this time, it's likely going to be easier the second time around (especially since baby number 2 is considerably smaller)... I never even considered the possibility that I may not be given the chance to even try!! I feel rather cheated, to be completely honest (again, a lesson in control, apparently). I had planned to have my natural(ish) delivery with my lovely family doctor, but now I am about to meet an obstetrician to discuss cesarian sections and whether or not we should attempt to try to turn the baby manually. This was not in the plans, people! I know that women all over the world still deliver breech babies, but none of the doctors at my hospital are that brave (nor am I). Breech vaginal delivery is sadly a lost skill for most modern day doctors.... so if your baby remains breech, you get a c-section. And I know that tons of women deliver by cesarian all the time, and many even prefer it that way.... but it's really not the way I want to go.... If only I had a say in the matter! I've tried talking to this baby, encouraging him to turn. I've tried "letting go" and trying to trust that nature will take it's course and the baby will turn spontaneously. I've tried various ridiculous looking upside-down yoga postures. I've tried the hot & cold water bottle technique.... but so far every morning I wake up and feel his little head pressed into my stomach and his little feet kicking my cervix & bladder. If you have any other tricks you've heard of for turning a breech baby, please let me know! This baby/pregnancy feels so different all around compared to my first. For one, this baby feels way calmer (I'm hoping this predicts a calmer baby temperament post-birth as well!). Zac was crazy active inside me and his violent kicks would trigger rather unnerving bouts of braxton-hicks contractions from 27 weeks on. But while this little guy still moves around a lot, his movements are gentle and more like quiet stretches after a long nap. Again, I am hoping this reflects his future personality! Another difference is the size... this is a much, much smaller baby. I've actually struggled to gain weight this pregnancy, even despite eating my weight in Christmas cookies over the holidays. Now I know it sounds weird to complain about that (most people complain about the opposite in pregnancy), but poor weight gain in pregnancy is less than ideal as well. My inner worrier can't help but think it's because there's something wrong with the baby. I mean, I'm not doing anything differently this time around (other than constantly chasing a toddler around!). Despite normal ultrasounds, normal screening genetic testing, and constant reassurance from my doctor that everything is fine, I can't seem to shake the feeling that something might be wrong and preventing the baby from growing properly. That's also because I'm comparing him to my first baby... who was ENORMOUS in utero! For reference, here's a photo of me at the end of my first pregnancy, with my 40 pound weight gain and jumbo baby bump... that's a lot of extra poundage for this petite 5-foot-3-er! My more rational brain reminds me that both my husband and I are small people, so it actually makes more sense to have a smaller baby. But I'm kind of a natural worrier so somehow this doesn't reassure me completely. If everything ends up being okay in the end, I can see myself looking back on this post and realizing how ridiculous I must have sounded complaining about having a smaller baby, a covetable in-the-front basketball baby bump, and no stretch marks... but until I have a healthy baby in my arms I don't think I can truly celebrate. 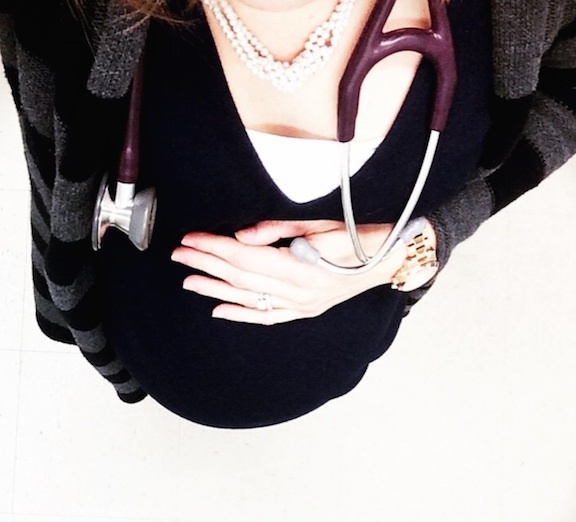 Being a medical doctor and knowing all the possible risks and complications of pregnancy, combined with an innate worrying tendency and an incessant need (and failure) to control every aspect of my life, is not a good combination! This is a big lesson for me, I know. There is nothing I can do to change the course of nature. Whatever will be will be, and whatever happens, happens. On a deeper level I know that I will be able to handle whatever comes my way... C-section or natural birth, healthy baby or complications. We already love this baby so much, and that is truly all that matters. Thank you, Elise. I've been considering acupuncture... and I will definitely look into it if my version doesn't work (it's tomorrow morning - fingers crossed!). I am 35 weeks tomorrow Vanessa! So excited!! Chiropractor Toronto does not include oral medicines. Such treatments are much easier only when full cooperation is received from the patient throughout the therapy process. People can rely on this practice as it solves many cases. This also helps in making bodies function and work normally. chiropractor Toronto is an excellent place to find ways to relaxing your body and let it work the right way. After going to acupuncture meadowvale my depression and anxiety (associated with chronic pain) have improved over the last month. These guy are quite wonderful: compassionate, peaceful, knowledgeable, and have a calming presence.